The brick and clapboard colonial house at 165 High Point Lane sits on a two-acre level property in the Greenfield Hill section of Fairfield. FAIRFIELD — High Point, North Carolina is often referred to as the furniture or home décor capital of the world. Its twice-annual market attracts about 100,000 exhibitors and buyers from across the globe. At this year’s fall market, Oct. 13-17, designers will introduce exciting new products, new looks, and trend-setting décor that is sure to “redefine the shape of home fashion,” according to www.highpointmarket.org. Whether those trends embrace the past, endorse the traditional, or espouse futuristic styles, chances are the furniture and interior design concepts showcased during the upcoming market would look beautiful in the versatile colonial house at 165 High Point Lane in the Greenfield Hill section of Fairfield. Although this sophisticated brick and clapboard house with black shutters and mansard roofs was built in 1966, it was updated to contemporary standards. That updating incorporated a number of features for modern living including a wet bar room inside and a 20-by-44-foot heated Gunite in-ground swimming pool outside. The pool features a built-in spa and waterfall. The backyard features beautiful gardens and a large bluestone and red brick patio with a built-in Viking grill and built-in fire pit. The state-of-the-art wireless sound system includes outdoor speakers. The setting and its landscaping create a private paradise, the view of which is not interrupted by unsightly utility poles and wires. The utilities are underground. The 5,500-square-foot, 12-room house sits on a largely level two-acre parcel on a cul-de-sac. At the end of that roadway there is access to protected lands with nature trails. 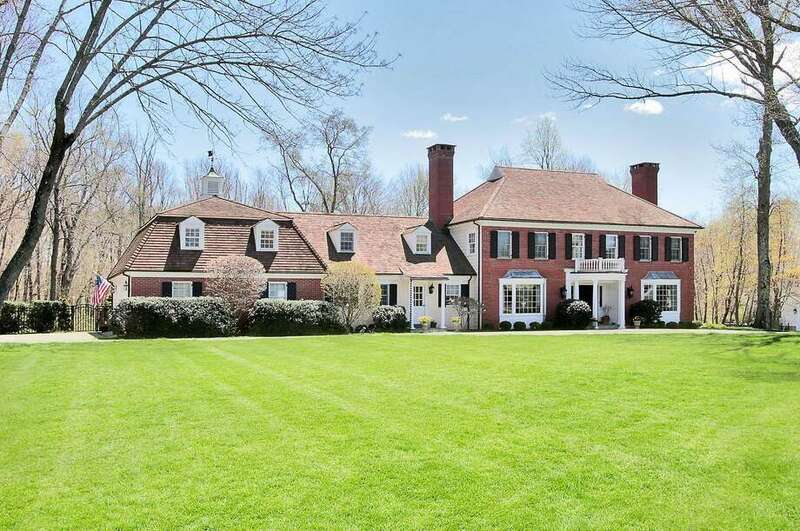 This property also enjoys proximity to the Connecticut Audubon Center and its Roy and Margot Larsen Wildlife Sanctuary. The entrance to this property is through its semi-circular driveway, which leads to the French doors flanked by sidelights with leaded glass that open into the sizable foyer, where there is marble flooring and a gracefully curved staircase. From there are two sets of French doors, one to the right into the spacious, front-to-back formal living room, and the other into the formal dining room. The living room has a marble fireplace and bay window. The family room has a tall, vaulted ceiling, a wall of gray brick that includes a fireplace, built-in bookshelves, wood-paneled walls, wide-planked and pegged hardwood floor, and sliding doors to the three-season sunroom, which has a slate floor and ceiling fan. It also has a wet bar room with two walls of cabinetry and glass shelving, and a beverage refrigerator. A third fireplace is found in the unfinished basement. In the dining room there is a bay window, teak parquet floor with inlaid detailing, and a wall of hidden china cabinets for storage of dining ware. In the gourmet eat-in kitchen there is a center island with a breakfast bar for four, ogee-edged granite counters, farm sink, built-in desk area, and high-end appliances including a Sub-Zero refrigerator. This area of the house also contains the butler’s pantry, laundry room, a full bath, an office or bedroom, and access to a staircase that leads to a large bonus room about the two-car attached garage, which can be a play or game room. The full bath can serve as a cabana for the pool. From the kitchen there is also access to the sun room, which opens to the expansive patio, yard, and pool. On the second floor there are four bedrooms. The master features a sitting room and bath that has a limestone floor with sand glass inserts and old-fashioned claw tub. For more information or to set up an appointment to see the house, contact Karen Waldvogel of Al Filippone Associates/William Raveis Real Estate at 203-209-0870 or karenw@afahomes.com.